Nothing worth having always came easy. It was an lesson that was hammered time and time again but many had to learn this the hard way; an lesson Amy had to learn in her own journey. Getting out by herself into the world had been absolutely terrifying for her at first even if in hindsight at the time she should have planned better for her trip but it was all in the learning process. She had wanted to become a stronger person both physically and mentally, and for the most part during her trials she felt she had more then achieved that. The naive, and if she was honest air-headed girl was gone and replaced by a more grounded young woman. Amy still had her flaws, she knew, but everyone did what was more important was the growing aspect of things. This dimension was similar but at the same time very different from where she was from. At home, on earth at least, you just had Humans, Mobians and maybe the odd alien or two. Here, the supernatural was a very real thing and she was still wrapping her head around the various native races on earth alone. She adjusted quickly though, after all its what she did when she was going to different worlds. One might find it strange Amy didn't have an overwhelming desire to return home, but the sad truth was she had nothing waiting for her. Everyone had their own lives, and the anchors, or people she was closes to were no longer in this world anymore. It would always be her biggest regret and failure but there was nothing she could do about it but move forward. Still, she had work to do with this Hunter Alliance business but at the moment she didn't really belong to any group and just did things mostly on her own. That suited her just fine, after all that was what the last couple of years of her journey had been like after all. Amy would get used to it in time, right now she was just exploring but maybe she'd go shopping, if only to browse really. While she had long since lost her appetite for that sort of thing, it didn't hurt to look. Her appearance did draw attention from some, but she was used to it. Most of the time these days the only time that sort of thing bothered her if it came from people who weren't strangers. After an time, Amy decided she had enough of exploring for the day and decided to check in on the few friends she had on this particular version of earth. You didn't really a l lot of friends, just a few good ones you could count on when you got yourself into a bind. She sped off towards her destination but didn't go overboard; she was advised not to use her speed as much when possible when in the city. She wasn't near as fast as Sonic just yet if ever, but she could concede how it might draw too much attention anyway. The young Mobian woman arrived at what seemed to be a small dojo that was located just in the crack of the larger, more towering buildings. It was old judging from the outside, with the paint a bit faded in parts but it had a welcoming air to it. Amy stepped inside, the slight ringing of the bell was heard as she entered. Just in the front to the left was the check in desk, and to the front was the standard mat where people were training; a few pictures and certificates littered across the wall. What was also interesting was the picture of the 'main' instructors of the establishment; the first was of a older gentleman with slightly graying hair but the next was an woman. She looked quite a bit different then normal. 'Sensei' Makino was their name just under it. Just as Amy was putting her shoes to the side(out of habit for things here) a female voice called out. "You're here a bit earlier today, business been slow?" It came from an attractive middle aged woman just behind the desk with black hair and eyes, their hair was done in a bun. "My daughter should be done soon if that's who you're looking for. Son in law is busy." Amy smiled waving her hands. "Come on, I always have time for and the rest, not just Makino and Rao. How have you been Mr.s Akagi?" The older woman huffed. "Mrs. Makes me sound old, but you've always been insistent with that so it doesn't bother me. I think I've been doing all right. Mino still complains about his back, but since he hasn't given up teaching its more talk." Amy shook her head, but look amused. "I think even if he found both his legs and arms gone, he'd still try to find some way to teach. It's in their DNA." "Oh, I quite agree." Akagi said with a warm chuckle. A brief lull in the conversation naturally entered as another woman with a small came from the mat, the woman looked to be in their thirties and the child, complete in a white Gi didn't look any older then five. They seemed to be sulking, hanging back and just behind what was assumed to be their mother. "Afternoon Takara and little Sano." Akagi greeted the young woman and little boy respectively. "Afternoon. We decided to leave a bit early, something came up.." Takara glanced down at her son before looking at the other women. "Don't mind Sano, he's just been sulking because he feels like he didn't do good today and we left early." It seemed strange at first, but the regulars had mostly gotten used to Amy's apperance and a lot of the kids liked her, which was a bonus. Amy smiled, then made her way over to the boy. "What's the matter? That look doesn't suit you." The boy perked up slightly, then shook his head. "Didn't pass the test today." Amy took it in stride, nodding. "I know its rough not doing things the first time, but life is can be like that. Sometimes we don't succeed the first time, or even the second and third but its important to keep trying. You got closer this time, right?" At the brief, hesitant nod, Amy continued smiling. "Then, you're on the right track. The important thing is don't give up when you're close. Your mom, me and others are rooting for you, so just keep doing your best and you'll get there okay?" An mumbled 'okay' came from the boy and Amy seemed satisfied with that. 'That an boy." Amy said ruffling his hair briefly, making them flush a bit. Takara finished her conversation with Akagi, but caught the tail end of the conversation. "Thank you Amy. I wish I could stay longer to chat but we really have to be going. I'll see you two later." Amy waved them off, feeling a bit more in a good mood since coming here not that it was hard to do. She typically did since she felt at home here for the most part. Akagi was folding some paper work on the desk, then she paused glancing at the clock. "Why not go in the back and wait in the room for my daughter and my husband if you want to talk to them? Children classes is about to be wrapped up, and adult ones don't start until an hour or so." Amy thought about it, then shrugged. "We'll, all right. I'll see you in a bit." She headed towards the backroom, but she was careful not to disrupt the classes. In the back room there wasn't too much out of the ordinary, some family pictures along with various ones of places they had been. Amy was even in some of them, which while small meant a lot to her because they treated her like family. Amy never knew her birth parents. She didn't even know what it was like in a general sense, due to before Amy never had anything remotely closing in 'parental like' figures. Sure in strictest sense, she was grown but that support and warmth that came with it was something she hadn't realized she wanted. Though with being thought as another daughter meant Akagi had brought up comments like she'd be a 'great mom' or if she was going to see anyone. Amy always dodged both questions or skimmed them over, so Akagi left it alone. She meant well it was just her own hang ups, but maybe it was time to move past those. The door creaked open, disrupting the woman from any further thoughts as Akagi, an older man in a Gi, and the same woman posted on the picture dubbed as 'Sensei Makino' seen earlier. Akagi sat down in a seat, the older man, sat down behind the desk while Makino sat by Akagi, having to fold her wings even closer to her back not to break anything in the room. Amy didn't want to waste time, but besides just their usual she had something on her mind. "Its good to see you two, how did class go?" Makino smiled softly. "Better. Everything went pretty well, all things considered. I haven't been feeling this good in a while since things got stabilized and I got to teaching again." "We were fortunate a surprising amount of the old students were understanding of their old teachers new..condition thanks to Tylon.." Mino's said with distaste, before shaking his head. "But you didn't here for just that, did you?" It wasn't an question but an statement. Amy,rubbed her arms a bit; she didn't like being the bearer of potential bad news. It was a small tale tic of hers when something was bothering her. "I don't want to sound the alarm, but Brandon thinks there may have been some people working from Tylon in this area." She held up her hands. "Not here." She corrected quickly. "But just in this general area of Japan." Makino tensed, eyes narrowing. "I'm Not going into hiding again Amy." Amy frowned, knowing how stubborn her friend can be when she wanted. "Your pride isn't going to help you here." "It's not my damned pride! I.." Makino took a collective breath, letting the anger she was feeling deflate; it wasn't directed at Amy. She calmed down a bit, looking a bit more withdrawn and defeated. "I was happy." She finally said, calmer. "I've..been having to hide myself so long, not able go to my family because of danger. Then Brandon helped with his cover story and other things he did..and I didn't have to worry about all that. I..just thought I would have more time, guess I was naive.."
Amy felt bad for her friend, it was one of the reasons she didn't want to bring it up. "Just remember, we don't know for sure but its best to be cautious in case y'know? Besides, its part of my job to deal with the super powered crazies. All four of us, really. We can't do much legally to Tylon, but we can defend ourselves. Your husband has those kinds of resources on his side. If nothing else, Pokemoprhs aren't as high on the list anymore. According to Brandon anyway.."
Makino mutely nodded, standing up. "I'm going to get some air.." She excused herself and Akagi decided to follow after them. Amy mentally sighed to herself, knowing it was going to be one of those times. Brandon was in the local coffee shop waiting for Torias and Amy to show up, pushing away any lingering but almost always constant parnoia creep up. It's what kept him ahead and alive through these years, but sometimes it just got in the way. The only thing was he had come when to embrace it, and when to ignore it. His circle of friends were oddballs and misfits but he didn't mean that negatively since he himself was included. Amy was basically a mutant since Mobians(as told by her) weren't born with abilties like she had. He was a science experiment in some underground dark parts of a company with a happy smiley face, and Torias was a half vampire. Of course ironically, the half vampire was probably the most "normal" one of said three, whatever that word even meant these days. Years ago he had toyed with the idea of some succide run to do as much damage to Tylon as possible before he died, since he was going to anyway but multiple things held him back. The first, was realistically he wouldn't be able to get much done since he didn't doubt they had changed security and passages for that exact same reason. The second was, as much as he loathed to admit it, not everyone working for Tylon was a bad person. Many were just men and women doing desk work and trying to support themselves and their loved ones, having no idea of the darker side of the company. He'd know from experience; he'd count Isabelle Cunningham as one of them but he didn't know them personally to say for sure or not. He respected what they did though; it just wasn't for him. Amy might be considered more traditional, but even with her he didn't think she was squeaky clean either. Not that they knew everything about their past. What's taking them so damned long? A young man in a black trench coat comes walking in. Most hunters would know him as Abraxus Abraham, one of the top hunters and rightly so. It was said that he and his Cell, with the help of a few others, were the ones who brought down the old Hunter Counsel, which caused a restructuring into what they were now. Abraxus looks over to Brandon and heads over. He reaches into his coat and pulls out a manila envelope and places it on the table that was right across from Brandon, taps it twice, then turns and starts out. If Brandon didn't know the figure, he wouldn't have trusted the single envelope that apparently been brought to his attention. Though he wasn't that stupid and Tylon wasn't that stupid to go for that sort of old trick or he'd be dead a long time ago. Not to mention since with the new gig, they had to be more covert then overt which suited him just fine since they weren't on his nuts like a pair of groupies on a rock star band all the time. Tylon didn't like their prized projects betraying them, who knew? After another brief moment, he decided to see what it was Abraxus had left behind. On the envelope, it said not to open until his full team was there. It felt like there was a small device in it as well. That was curious, but Brandon decided to quash what curiosity he had and wait for the other two to show up. He be lying to say he had nothing but time but a few minutes or so wasn't going to kill him. "Sorry we're late, something came up.." A familar female voice caught his attention, it was Amy along with Torias with his hands in his pockets. "Isn't it always though? Not an big deal, have a seat I have a present but not sure what it is yet." Brandon admitted as he got the envelope. "By who?" Torias said quitely. The other man shook his head. "Abraxus. It just said to wait until you two got here, so let's find out what it is together." Amy didn't comment, not feeling there was anything further to add as things got underway. She was more curious then anything. "He knows all the current Hunters and will likely rabbit if he sees us. Your mission is to observe and report only. Find his base and report it to HQ." he says "It's important that he doesn't suspect you are there. If any problem that you can't handle should arise, there's a number for backup on the phone." the video ends. Brandon folded the envelope away after it was done. "I didn't expect something like this, but its probably simply because all three of us are new except you, but they said all so that probably includes me and Amy." "Probably.." Torias conceded, thinking. "We can cover more ground by doing her own avenues and reporting back to each other." They weren't apart of an team 'offically' at least not yet, since it was just the three of them but they did help each other out. Besides it be something to work on, either joining another one or finding a few others they clicked with to form a new one. "It just said he was found, but no where. It might not even be in Japan.." Amy trailed off. "If he's smart, which he is, it won't be anyway." Torias stood up. "I'm going to do my own 'rounds' as it were and get back to you two if I find anything of note. What are you two doing?" Brandon shrugged a bit. "Tracking is a bit of what I do, or did. Let me worry about it." Amy knew these types of missions were her weakest area, but you had to start somewhere. "If its okay, with you I'll be around helping." Brandon didn't know what she'd be helping for in this kind of situation but the potential was there. "Fine with me. Beats the hell out of just hearing my own voice all the time." "We aren't an offical Cell, and I'm not your leader so what you two do is up to you, but just like always it helps. I'll see you two in a bit." Torias then left. Brandon left a tip, then stood up and headed out with Amy in tow. Decisions, decisions, and so little time in which to do them. If they looked on the cell phone, they would have found a message with directions on where they could find an informant that would lead them to where their target was last seen. While Brandon was doing his thing, it did occur to him there might be some extra information on there so he opted to have another brief look at things. Sure enough there was, which was better then what they had. "We'll of course its the obvious.." Brandon muttered to himself, shaking his head. "There's directions of a informant for a bit more info. I'll let Torias know." Amy wondered why no one thought to think that, it was almost like something had fogged their thinking. Though sure enough Torias said he'd be right back, that way they could all be there for it instead of having to play catch up when they got to their destination. As the three got to the location, there was a shifty looking fellow waiting there "It's about time you three got here!" he hisses "I was almost thinking you guys wouldn't show up." he says as he starts off "Okay, come on! Follow me." Torias wasn't sure if he reconized them or not but there were a Lot of Hunters and those allied he didn't of course. Looks can be deceiving and all and in their job, that was kind of the point at times. "Sorry about that, there was a slight mishap before we got here." Informants usually only meet with one person, in this case it was Abraxus. Because of the nature of their business, they tended to make enemies. So Abraxus' informant meeting someone else, was rare. He leads the three to an ally "Right over dair. Dat's where da psycho priest was last seen." he oints to a hole in the wall drug store "It seems like he needs something from dair." he comments. 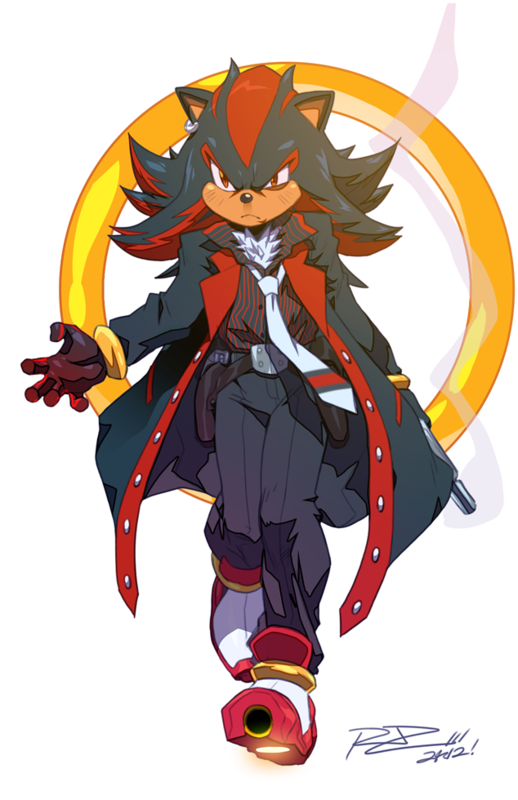 Since Vampire Hunters and normal Hunters were two completely different groups, Mulcahy wouldn't be hanging around any Vampire Hunters, since he wasn't in the market to hunt them in the first place. The problem was, is that Hunters look like normal Humans and since there were a few o them in he little 'hole-in-the-wall' drug store, one couldn't tell which were rogue Hunters and normal customers. It was kind of odd, only because of Julius and his daughter, then again vampires weren't the only thing just their specialty. As for Amy and Torias, they were casual about things as they browsed. But part of this doesn't make sense to me.. So Amy thought. Though she did recall the Father knew all the other more well known Hunters, so it was probably the main reason they were sent, though it didn't help their current situation. If there were other rogue Hunters, it was impossible to tell. On top of that, no one would be dumb enough to reveal much of anything. Even if they didn't recognize them and they managed to find one, they had no reason to trust them. Leverage was the key. She knew Torias would be listening but doing a good job of acting like a customer, which is what she was doing. The few customers weren't really talking too much, outside of the occasional question for the shop owner. Then they pay for their things and head out. None of them dropped any clues that they were rogue Hunters or not, and after they left, they went their own ways. It was kind of what Torias figured, but he didn't seem to pay it any mind as he continued to browse. He went to go pay for his things but before that he told Amy to catch up later. She wasn't happy with it but understood she tended to stand out. So she'd pay for her things and then leave. Brandon hadn't come inside, he was a bit out aways from the hole in the wall shop but looking at his phone he got what he needed. He was going to trail one of them for a bit, while Torias did the same for the other one. He didn't have Torias' fancy shadow stuff, but he Was good at being stealthy and keeping plausible deniablity. Kinda had to be to track down some of Tylon's run aways. Torias for his part waited a bit, making sure as he exited before seeming to vanish into the shadows. While part of him doubted either were rogue Hunters, just to be through he would do his thing and trail the second one for a bit. Unlike Brandon, he had it easier. The two guys end up meeting up at the same place. It was an empty warehouse that had lights set up almost everywhere "Were you followed?" asks one. The other looks around and nods slightly "I believe so." he says in a low tone. The first one nods "Okay. You know what to do." says the first one, who hits a switch, causing flood lights to snap on! Eliminating the shadows. The other one makes a circle in the air, which causes a flash in the area "Okay, you guys can come out now. We've managed to block the exits so you can't get in or out." says the second one. Since Amy had been told to hang back, , it was just the two for now but they were close enough. The fact they had floodlights and did the other actions did confirm if nothing else they knew what he was or at least about the supernatural. Torias saw no point in hiding at this point as he stepped out from his spot, keeping his guard up while internally calm. It wasn't like his powers were gone in light, just a bit weaker if he ended up having to defend himself. "I would say it was an mistake but that would be insulting you and yours intelligence so I'll get to the point. The fact were knowledbale enough to do what you did speaks for itself. That being the case, you already know why me and my team are here, don't you?" The first Hunter, places his hand on his ear, as if on coms with someone. He then looks over to the second one "Shut it down." he says, then looks over to Torias "Yes. You were sent here by Abraxus Abraham to evaluate you and your friends to see if you were ready to join a Cell." he says as the barrier and the lights snap off "Call your friends in. Your evaluator would like a word with you on why you failed." So that explained why the whole thing felt 'off' to Torias and probably the others to. It was disapointing they had failed, but it wasn't the end of the world; if nothing else it could be used as an learning experience. Torias called Amy, who sure enough came before too long, for one she was just outside and two she was fast to begin with. There was movement on the top walkway "Can any of you tell me what you did wrong and what you Should have done better?" asks The Shadow, as he looks down on the three below. It was Shadow, though Amy had to remind herself she didn't know this one. She and Shadow back home hadn't gotten along as well, but seeing how she was one couldn't blame them. Either way it wasn't important here. "I think we should all just waited and called it in, rather then having Torias and Brandon go inside. Then go from there instead of the more risky option of being found out." Amy explained. Brandon seemed to agree. "Pretty much. Though if we Had to go inside, I think it would of been better if all three were there instead if things went south. Amy was outside just in case things went wrong, but if things got jammed or it got to hectic there be no way for them to know." "I think I got to ahead of myself and stealth this time." Torias weighed in last. "So while I feel its partially my fault since that part was my idea, its something we owe to collectively since its an team effort. We work as one, and that means sometimes failing as one."